He lost his temper after the verdict, as prosecutors argued he should be denied bail. Ms Constand reported the attack, but the district attorney refused to press charges. The case was reopened in 2015. This verdict is being celebrated as a major win for the #MeToo movement. It shows that the shift in our society and culture from doubting to believing victims is also affecting the justice system. 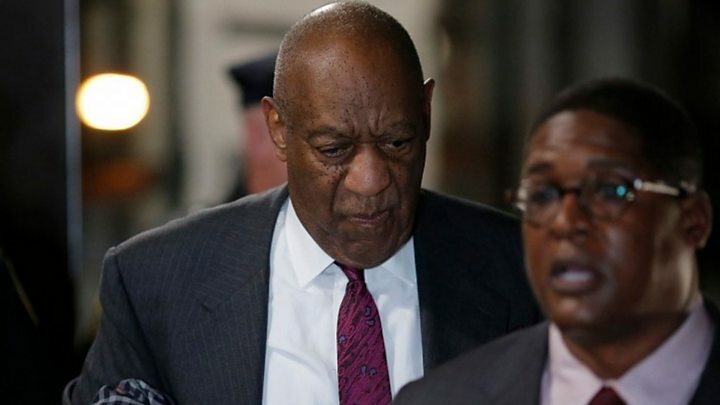 Bill Cosby's lawyers anticipated this and took direct aim at the movement during the trial, telling the jury "mob rule is not due process." But ultimately, the jury sided with Andrea Constand and set aside the 80-year-old comedian's wholesome image as American's favourite dad. At one time, there was no star bigger than Bill Cosby. He was the most watched man on television, a role model for minorities trying to break into Hollywood. And despite years of allegations, he seemed untouchable. That has now all changed, and there is no doubt that this verdict will have far-reaching consequences.